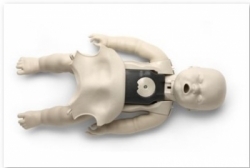 Life- features and weight allows for realistic infant CPR training. Sculpted body contours and realistic skin feel help prepare students for real life rescues. A head that simulates the way an actual infant's head would move. Face/head tilt enhances the CPR learning experience and teaches students how to open the airway during CPR. Available in single or 4 packs. Available in three skin tones: light (original), medium and dark. Prestan Professional Manikins may be equipped with a revolutionary CPR Rate Monitor that allows for instant feedback to both instructor and student regarding the rate of chest compressions. The visual feedback from the CPR Rate Monitor gives students a real life feel of delivering 100 compressions per minute. The CPR Rate Monitor is an optional feature and the Professional Series Manikins are available both with and without it. The CPR Rate Monitor may also be purchased separately and easily installed into your Prestan Professional Manikin.